A ripe peach is a thing of beauty; soft and juicy, slightly messy and best eaten over the sink. Peaches also go really well with rich meats, but in this instance I roasted them in spices and a little wine to serve as a simple pudding. They respond really well to spices, and especially the aniseed and floral flavours of Szechuan pepper. The Amaretti biscuits complement the natural almondy flavour found in peach stones. Slice and stone the peaches, lay them on a roasting tray and scatter over the remaining ingredients and pour in the wine. Roast in the oven for about 35 minutes, or until nice and soft but still holding their shape. Meanwhile, make the syrup by bringing the sugar and water to a boil, then stirring until the sugar disolves. Simmer hard for another five minutes or so, until you have a nice syrup. Add the sage leaves and leave to infuse while the peaches finish cooking. Remove the sage leaves before serving. Leave the peaches to cool for a while, and serve with the crushed Amaretti sprinkled over and some of the syrup. If you like, you could also serve with ice cream or very cold Eiswein. The colour of these peaches is wonderful, so be sure to choose a plate that brings that out. I normally prefer white but in this case a grey would work well. Place one half, cut side up on the plate, slightly off centre then rest the other one at an angle against it, again, cut side up. 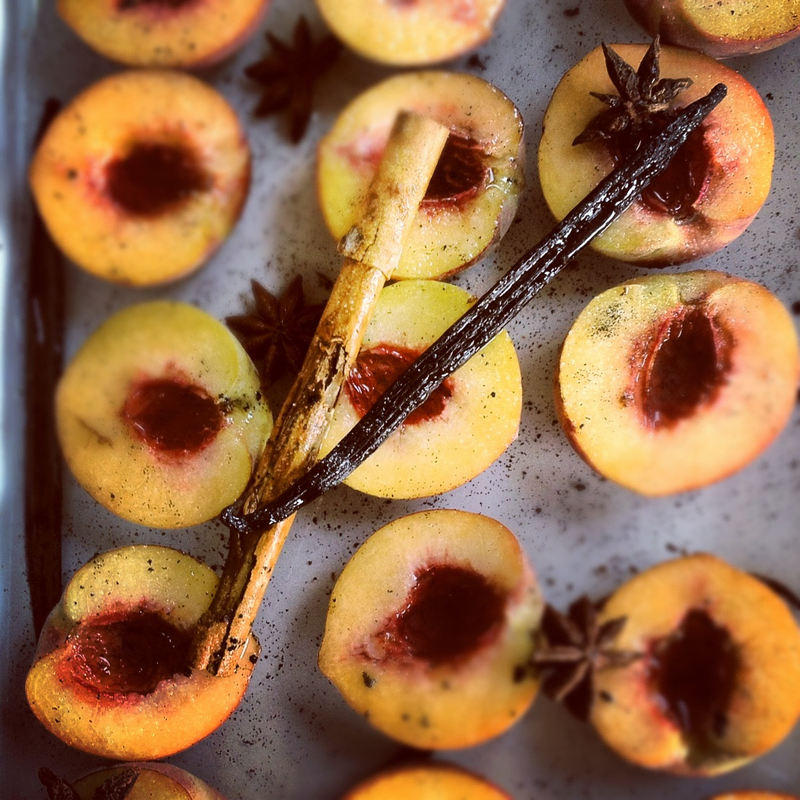 Sprinkle the crumbs over the peaches, put one of the star anise on the plate along with the almonds and lavender leaves. Pour over a little syrup.